New England Test captain Joe Root says that the experience former skipper Alastair Cook will bring to the team would be helpful to the success of the team now and in the future. Cook resigned from the role in February after record 59 games. 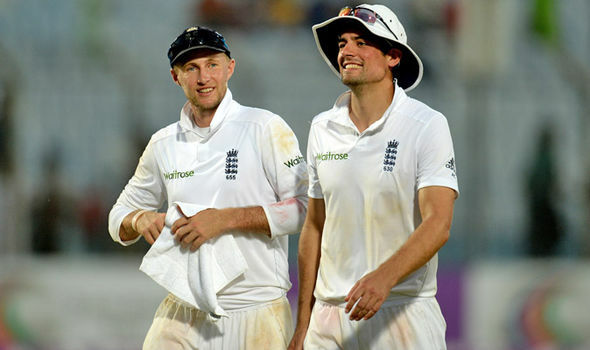 “I think Cook will be great. He’s done a fantastic job and I’ve inherited a side that’s so settled – he has to take a lot of credit for that. I’ve got fantastic senior players. Alastair is a great person to go to – he will let me get on with it and do it my own way. “It’s in his DNA to help the rest of the guys out. He always led from the front which is what made him such a great leader. If he’s firing on all cylinders with the bat then we’ll be in a good position at the end of the summer,” Root said. On the other hand, bowler James Anderson told the BBCSportthat he has no plans of retiring after the forthcoming Ashes series. The 34-year old Poms star fended off speculations that he might call it quits.